veg masala recipe mughlai style. 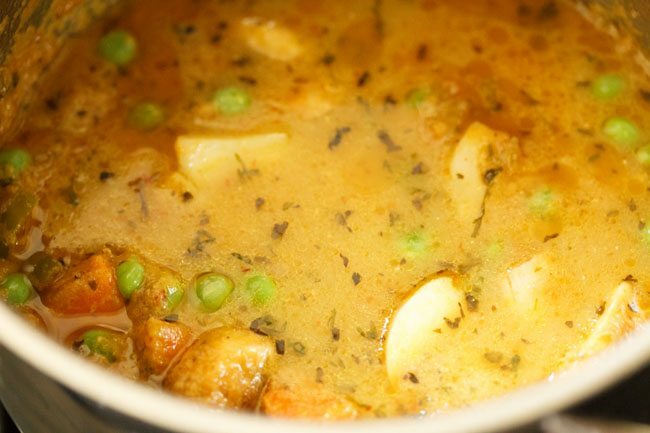 this is a delicious gravy recipe made with mix veggies and tastes restaurant style. 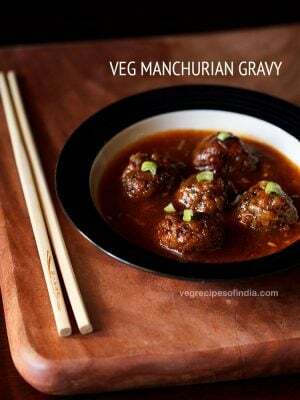 veg masala recipe with step by step photos – a delicious mughlai style gravy recipe made with mix veggies and tastes restaurant style. 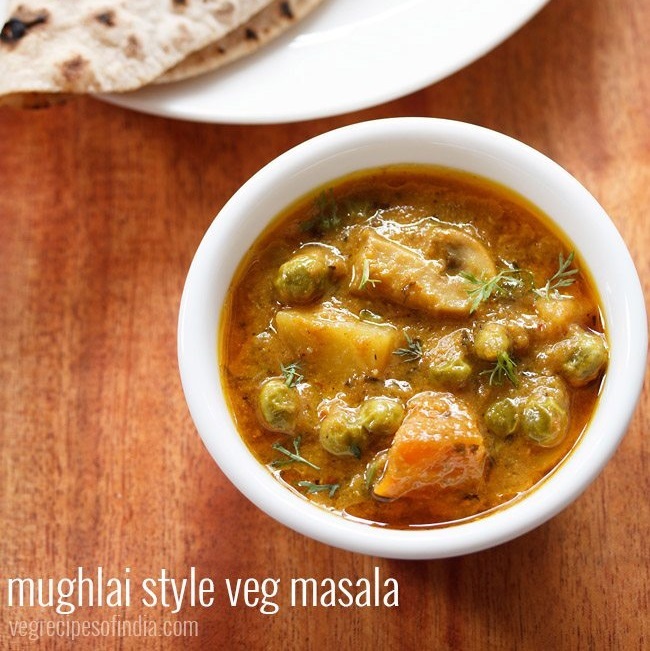 this mughlai style veg masala recipe is one of those recipes that i am preparing for many years. 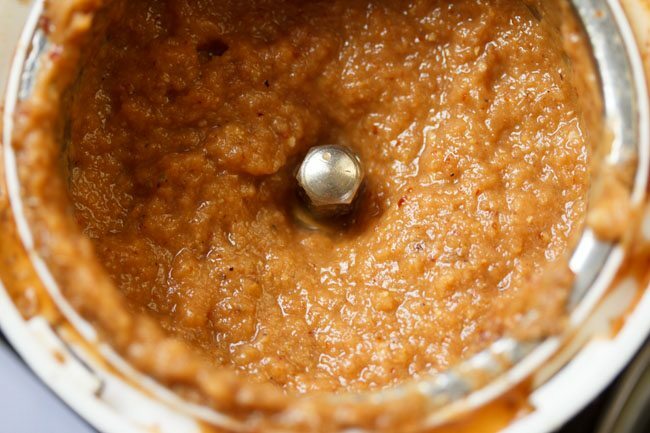 the original recipe made with meat, is from the sumeet mixer-grinder manual. i still have the manual with me after so many years. 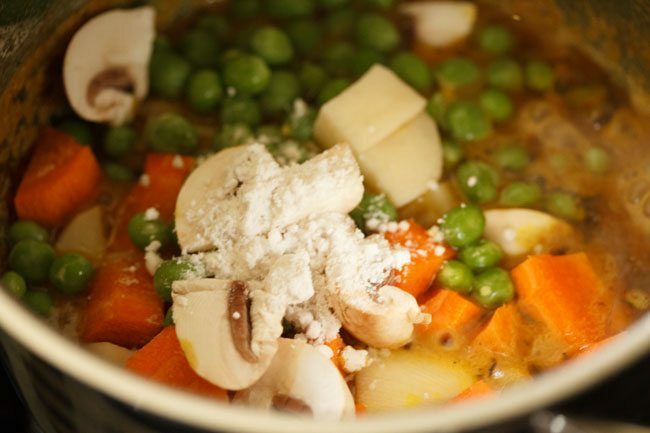 i make this gravy either with mixed veggies or mushrooms. 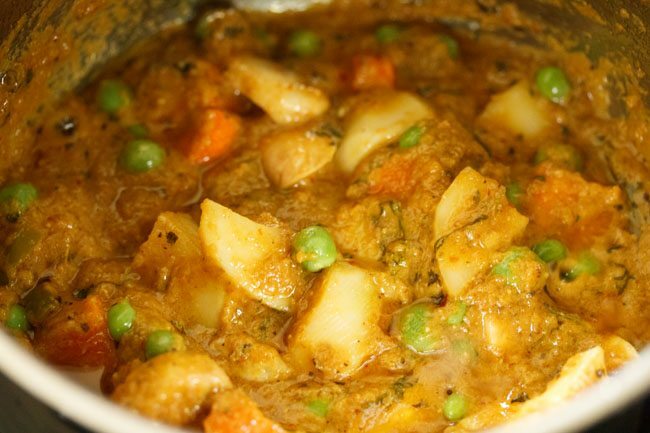 the veg masala gravy tastes very good with chapatis or naan or tandoori roti or plain paratha. though you can also have with jeera rice or saffron rice. 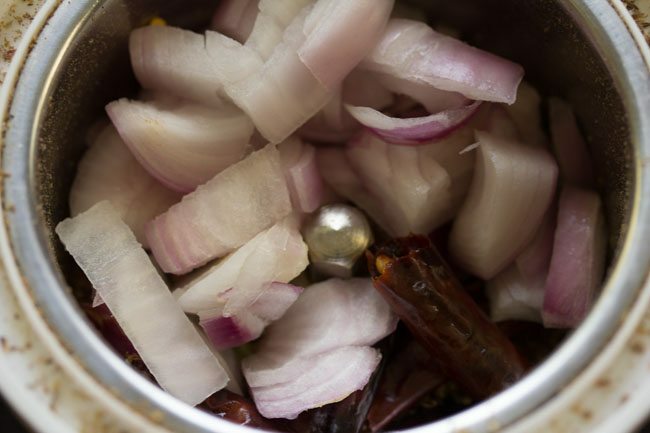 first rinse and then soak 2 to 3 dry red chillies in ⅓ cup hot water for 20 to 30 minutes. use kashmiri red chilies or byadagi chilies, which have low heat. otherwise the curry will become spicy. when the chilies are soaking, you can prep other ingredients like removing spices, chopping onions, coriander and mint leaves. 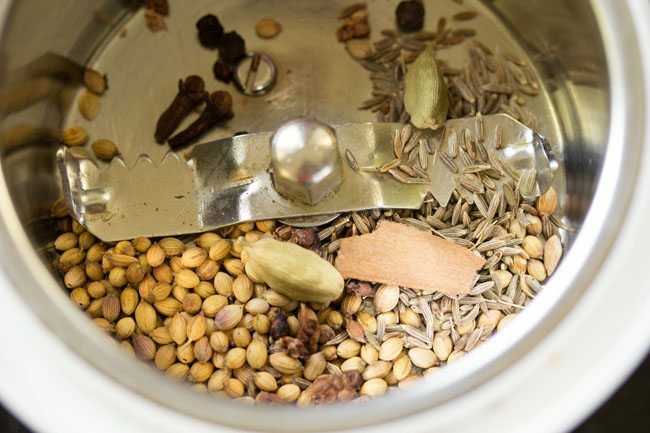 in a grinder jar take the following spices - 2 teaspoons coriander seeds, ½ teaspoon cumin seeds, 1 inch cinnamon, 2 cloves, 2 green cardamoms, 3 to 4 black pepper and seeds from 1 black cardamom. then add 1 cup roughly chopped onions and the soaked dry red chilies. also add 2 to 3 tablespoons of the soaked red chilies water. 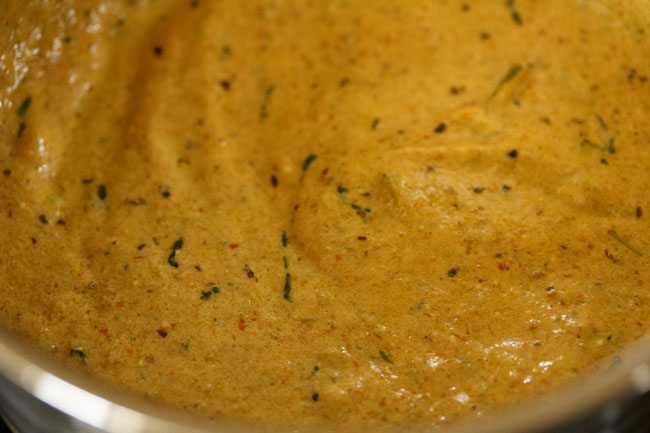 grind to a smooth masala paste. keep aside. 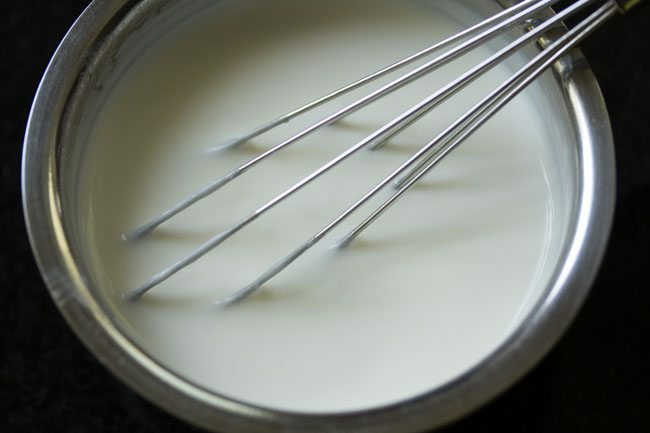 in a another bowl, take ⅓ cup fresh curd and whisk it till smooth. 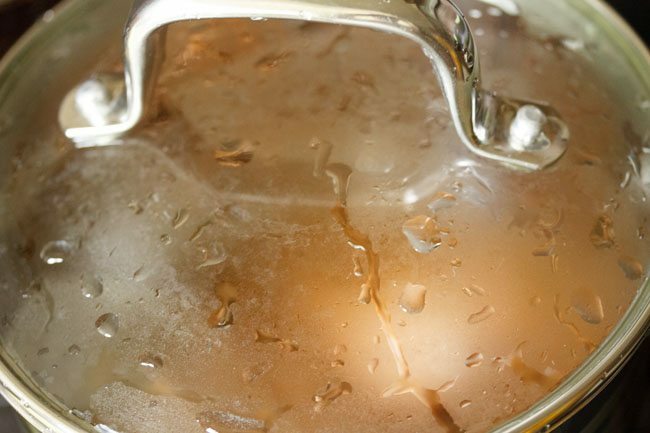 melt 3 tablespoons ghee in a pan. lower the flame. add the ground masala paste. stir well. cover the pan as the paste splutters. 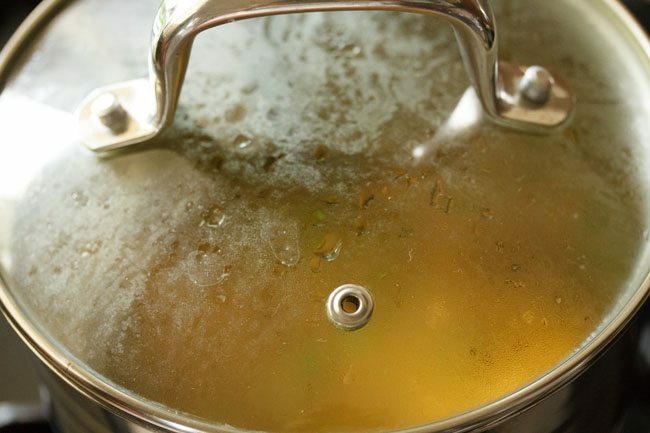 remove the lid when the mixture stops spluttering. then add ½ teaspoon ginger-garlic paste. 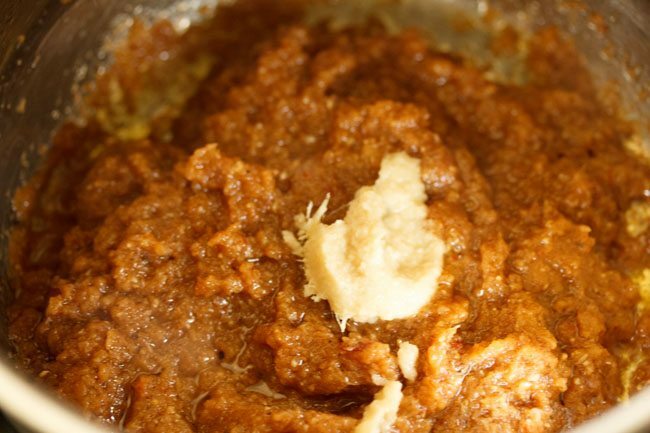 mix and continue to sauté the masala till you see ghee releasing from the sides. 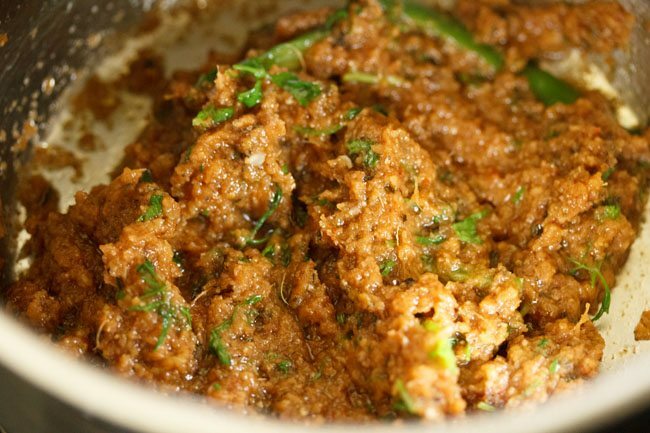 the masala paste will thicken and you will see the fat releasing from the sides. next add 1 green chilli (slit or sliced), 1 tablespoon chopped coriander leaves and 1 tablespoon chopped mint leaves or ½ teaspoon dried mint leaves. next add ¼ teaspoon turmeric powder. mix turmeric powder very well with the masala. keep the flame to a low and add the beaten curd. 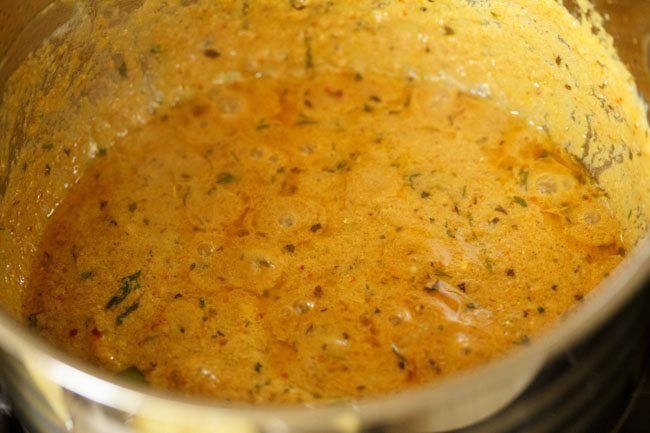 as soon as you add the beaten curd, quickly stir and mix it very well with the masala. on a low to medium flame, sauté this mixture. after adding curd, if mixture splutters, then cover with lid and cook. saute till you see ghee floating on the top and at the sides. then add the chopped veggies. add water. water can be less or more as per the gravy consistency you want. cover the pan with a lid. 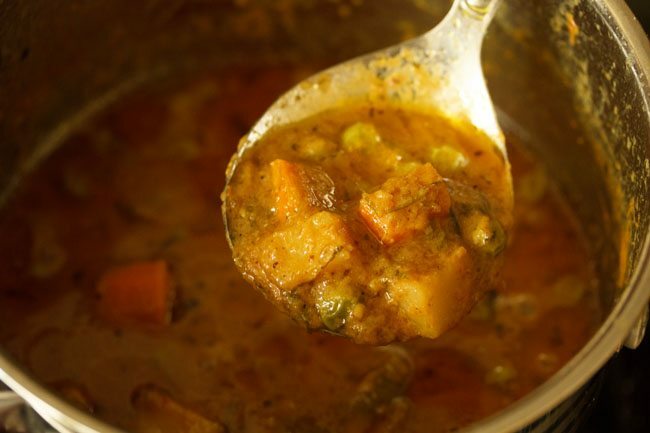 simmer the vegetable masala gravy on a low to medium flame till the veggies are cooked. do check a couple of times when the veggies are cooking. simmer till the veggies are done and tender. 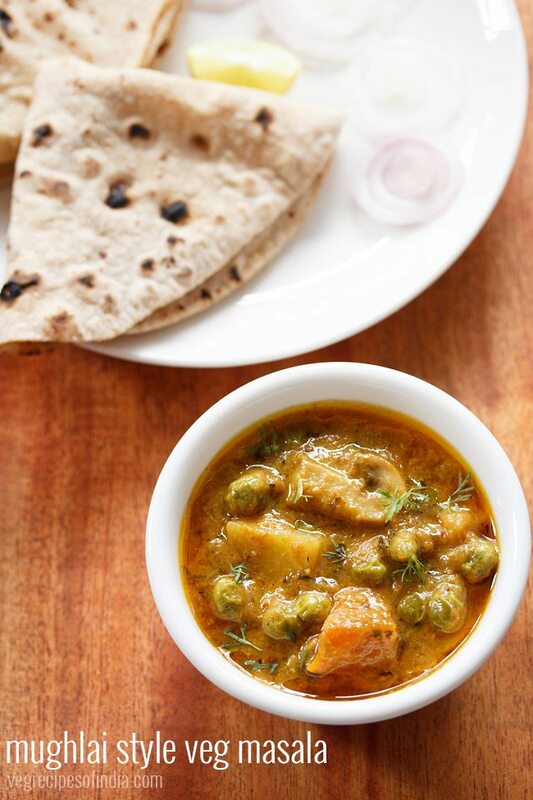 serve vegetable masala gravy hot with chapatis, tandoori rotis or naan. 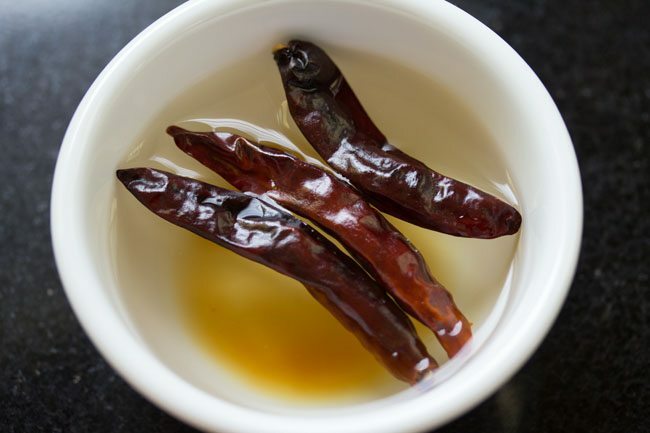 1. first rinse and then soak 2 to 3 dry red chillies in ⅓ cup hot water for 20 to 30 minutes. use kashmiri red chilies or byadagi chilies, which have low heat. otherwise the curry will become spicy. when the chilies are soaking, you can prep other ingredients like removing spices, chopping onions, coriander and mint leaves. 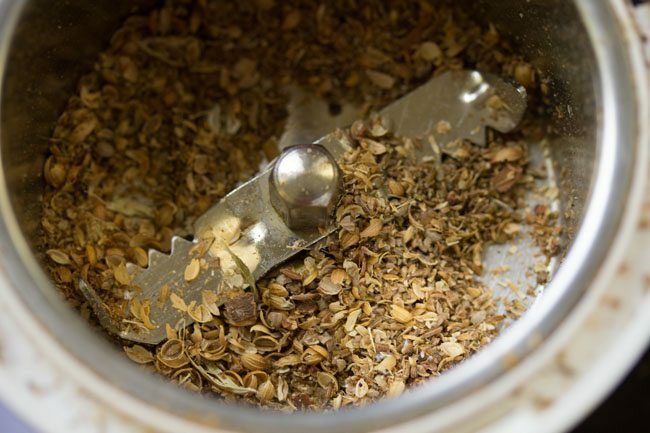 2. in a grinder jar take the following spices – 2 teaspoons coriander seeds, ½ teaspoon cumin seeds, 1 inch cinnamon, 2 cloves, 2 green cardamoms, 3 to 4 black pepper and seeds from 1 black cardamom. 4. then add 1 cup roughly chopped onions and the soaked dry red chilies. also add 2 to 3 tablespoons of the soaked red chilies water. 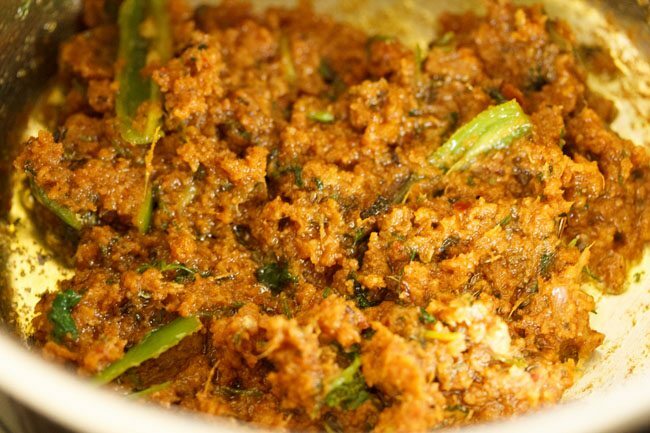 5. grind to a smooth masala paste. keep aside. 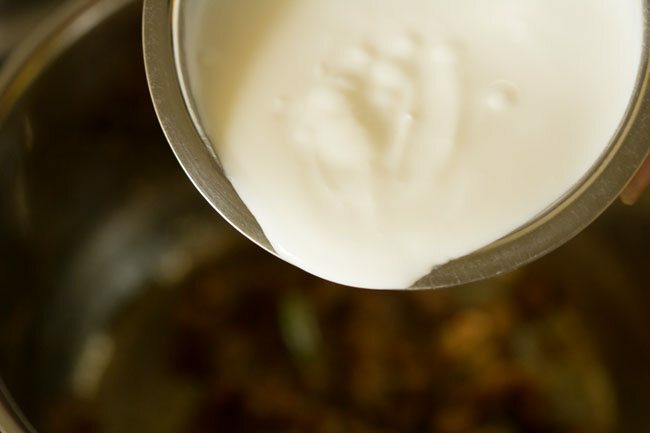 6. in a another bowl, take ⅓ cup fresh curd and whisk it till smooth. 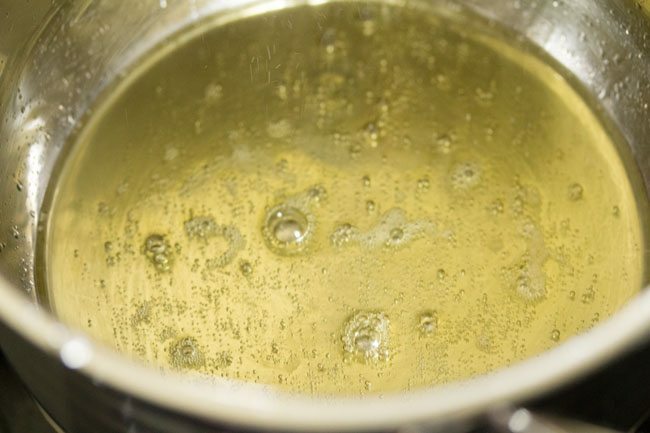 7. melt 3 tablespoons ghee in a heavy thick bottomed pan. lower the flame. 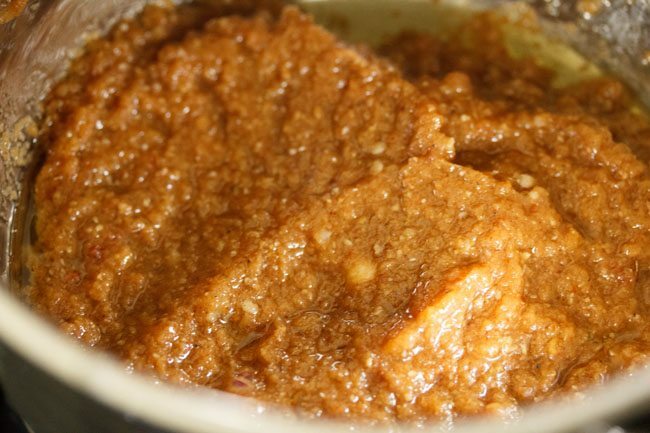 8. add the ground masala paste. 10. cover the pan as the paste splutters. 11. remove the lid when the mixture stops spluttering. 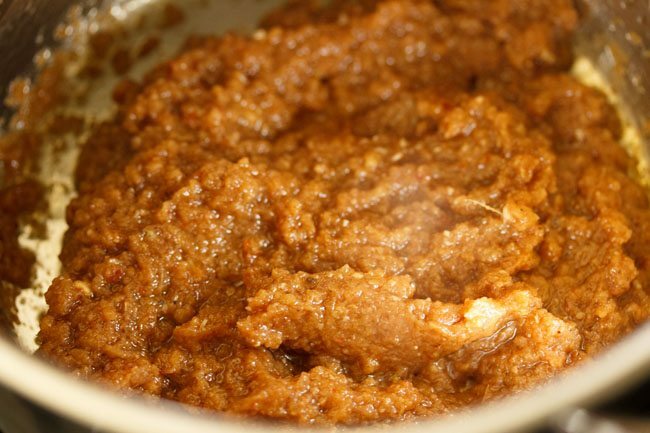 12. then add ½ teaspoon ginger-garlic paste. 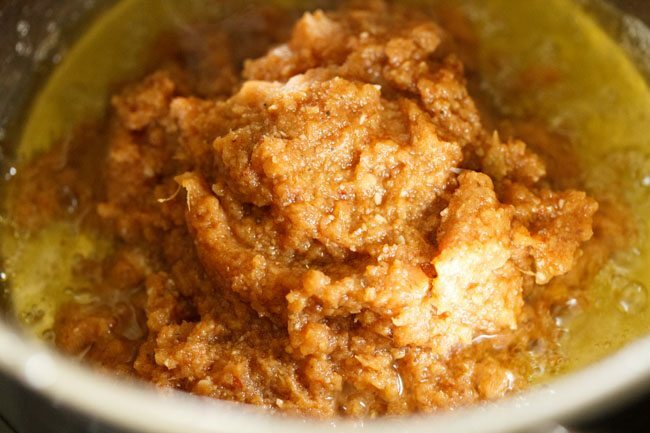 13. mix and continue to sauté the masala till you see ghee releasing from the sides. 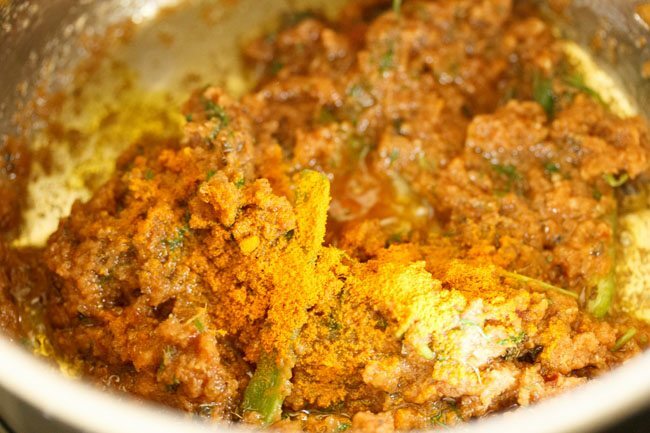 the masala paste will thicken and you will see the fat releasing from the sides. 14. next add 1 green chilli (slit or sliced), 1 tablespoon chopped coriander leaves and 1 tablespoon chopped mint leaves or ½ teaspoon dried mint leaves. 16. next add ¼ teaspoon turmeric powder. 17. mix turmeric powder very well with the masala. 18. keep the flame to a low and add the beaten curd. 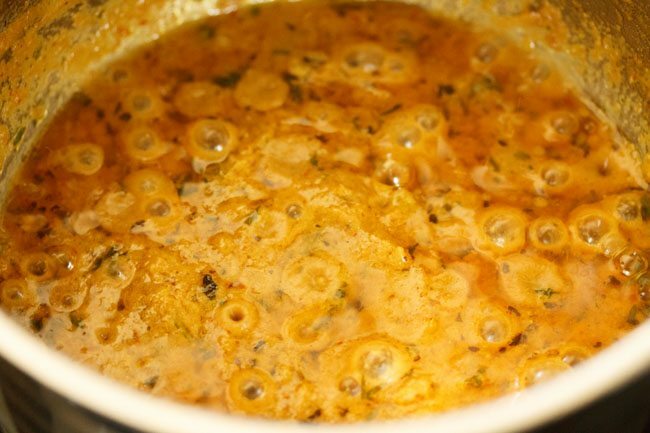 19. as soon as you add the beaten curd, quickly stir and mix it very well with the masala. 20. on a low to medium flame, sauté this mixture. 21. after adding curd, if mixture splutters, then cover with lid and cook. 22. saute till you see ghee floating on the top and at the sides. 23. then add 1.25 to 1.5 chopped veggies. you can add your choice of veggies. 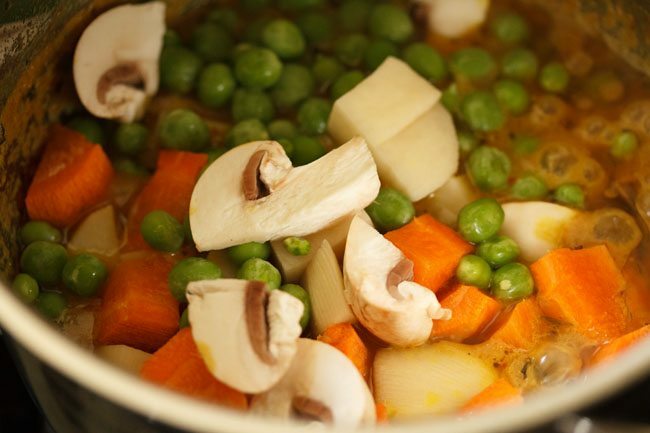 i have added carrots, green peas, potatoes and mushrooms. 26. add ¾ to 1 cup water. water can be less or more as per the gravy consistency you want. 27. cover the pan with a lid. simmer the veg masala gravy on a low to medium flame till the veggies are cooked. 28. do check a couple of times when the veggies are cooking. 29. simmer till the veggies are done and tender. 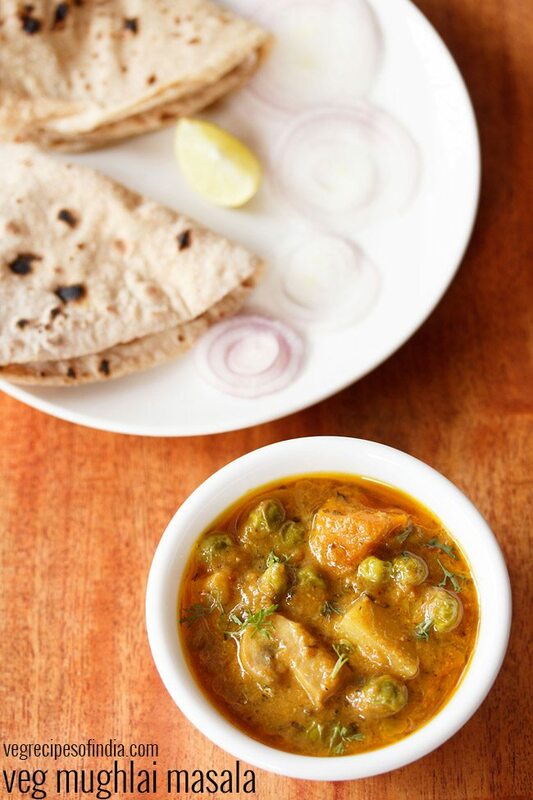 30. serve veg masala gravy hot with chapatis or tandoori rotis or naan or jeera rice or paratha. 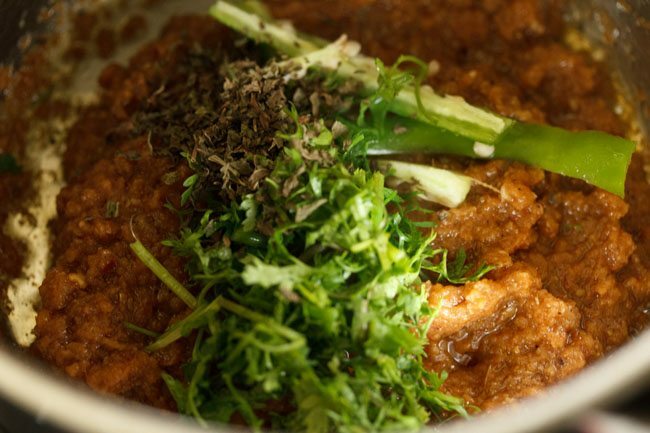 garnish with some chopped coriander leaves while serving. 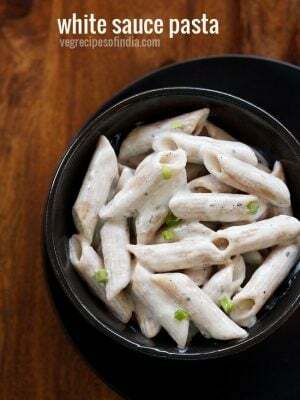 I’m from out of India … and whould like to know why do u serve this recipe with a bread and not with rice ? like in tali ? noam, you can have with rotis (phulka or chapati), plain paratha, naan, rice or bread. all these recipes are posted in the blog. feel free to ask any other query. Love your recipes and the site’s new look. Have made quite a few recipes from here. Some followed to the T, and some tweaked to suit our taste and the contents of my pantry. Each have been finger-lickingly appreciated. 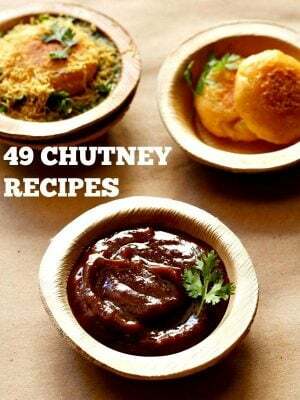 I stopped by this recipe because I read you have kept the sumeet manual. I, too, have kept Hawkins manual and that was my first recipe book ?. Looking forward to more interesting recipes. yes sure will try to add some nice recipes. agr itni der tak dahi ko gas par pakaege to phat nahi jaegi…. agr asi possibility ho tk is ko avoid krne k lie kya add kr skte hain?? dahi phat nahi jata. kyun ki sirf dahi hi nahin paka rahe hain. is me pyaaz ka paste ke saath masalon aur lal mirch ka paste bhi hain. ghar me main kafi gravies banati hoon, jis main dahi ki matra zyaada hoti hain anya samagri se. 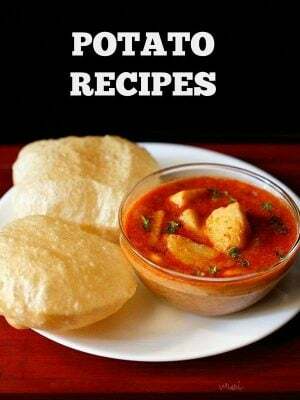 in recipes main bhi dahi phat nahi jata. dahi bilkul fresh hona chahiye aur mix karte samay, pan dhimi aanch pe honi chahiye. ya toh burner ko switch off bhi kar sakte hain. aur jaise hi dahi dalein, use turant and jaldi jaldi milaye. avoid kar sakte hain, par is se gravy ka taste badal jayega. 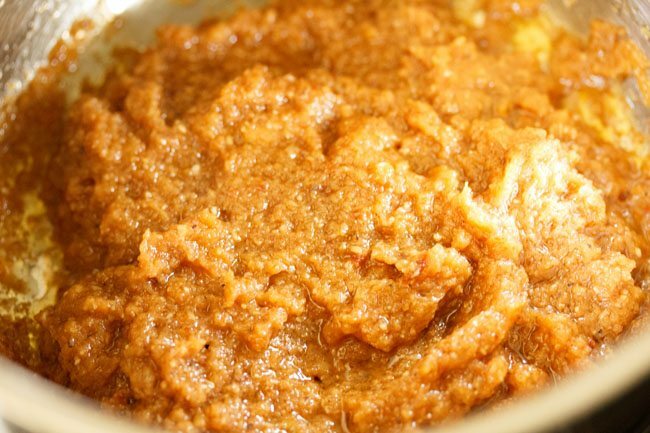 aap kaju paste, badam paste ya bhuna hua besan ya corn flour dal sakte hain. Very tasty and thanks for the same. I have almost learnt to cook just by going through your blog, which I always thought a very difficult task and today I enjoy cooking. you can add coriander powder. but the aroma of fresh coriander seeds is more strong than the aroma of coriander powder. So good.It turned out very well.Thanks a lot.I enjoyed my dinner today. thanks raji for the feedback. nice to know. 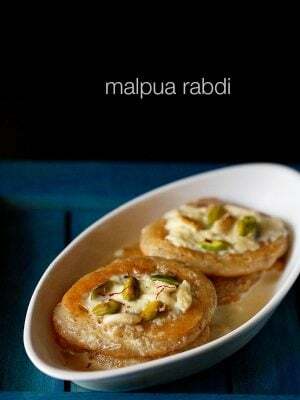 What a beautiful recipe, it’s beauty lying in its simplicity. I made this with chicken and cooked it in the cooker for just 1 whistle. I marinated the chicken is yogurt ,salt and 1 tsp of the ground masala without the red chilies and onion. I then ground the dry spices with the chillies and onion. Amazing, I think the base is such that it will lend itself well to a variety of meats and vegetables. Hallmark of a great cook, putting out recipes which can then be modified as per individual taste. Good job Dassana! thats nice to know anu. agree, the base is such that the recipe won’t go wrong if a mix of any veggie or eggs or meat is used. 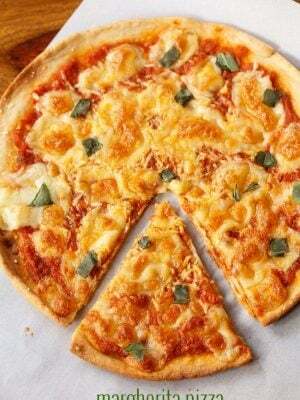 Hello Dassana, am your big fan and have tried lots of recipes and love it.. Every time I try to post somehow it doesn’t get posted. Hope this one does. I tried Veg Masala Mughlai but I think I have put more mint leaves than required, hence it’s a bit bitter in taste. Is there a solution to this?? Hope to hear from you. Thank you for posting great recipes. thanks shraddha. i have replied to two comments from you. not sure if you have written more comments as we have not received them. the bitterness of mint leaves can be balanced by adding some fried onion paste. so you can saute 1 medium to large onion till golden. then crush them finely or grind them with or without water. then add this to gravy. some curd will also balance the bitterness. you can also add some cream or cashew paste to get rid of the bitterness. hope these tips help. for any recipe that asks for mint leaves, always add the mint leaves and not the stem. adding the stems can make the dish bitter. Superb taste and smell… I prepared this dish.. Came out very well.. And my husband was surprised and happy.. Thank u so much..
thanks lakshmi for sharing this feedback. glad to know that the veg masala mughlai turned out good. neha, have taken the recipe request. will add. Is there a substitute for curd? Grace, no substitute as such for curd. but you can add tomatoes. add tomato puree made from 1 medium tomato. yes aparna, some paneer cubes can be added. but add paneer once the veggies are done. Can i use this base and add paneer? 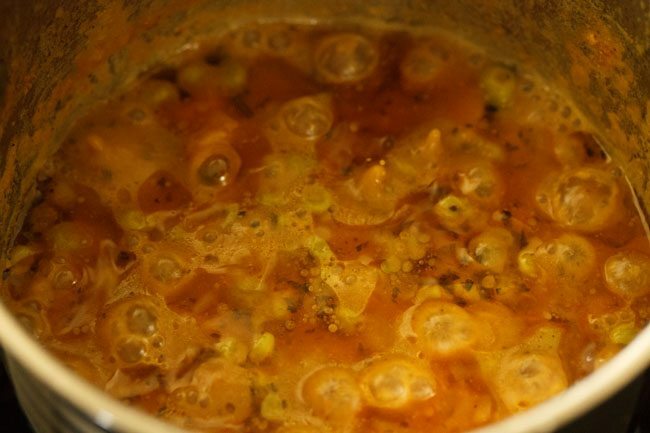 if only adding paneer, then add water and simmer till you see the ghee floating on top or on the sides. then add paneer and simmer for 1 minute. switch off the flame. Hi Dassana, if making non-veg version or veg and meat version, which meat should be used – chicken or mutton…or fish goes best with this gravy ? Hope to hear from you..tnx ! dimpy, the original recipe has used mutton. you can even use chicken. 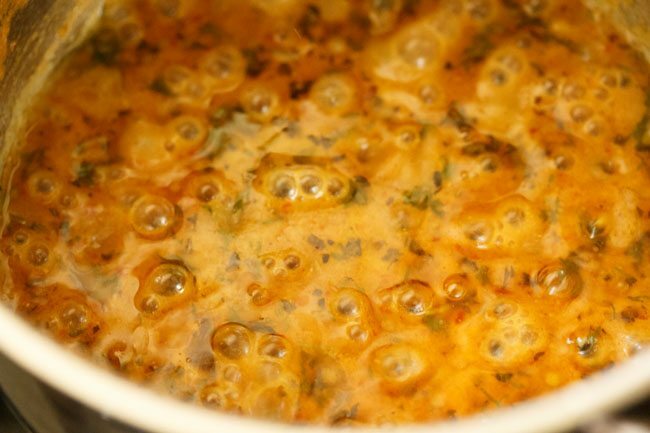 avoid fish as fish won’t go well in this gravy. Perfect ! Tnx ! Looking forward to trying this. 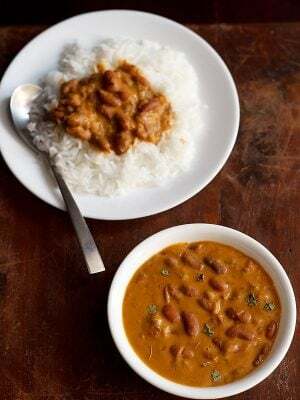 Btw, your Dal Makhani was out of this world, 10 ⭐️If I could rate it ! Welcome Dimoy. glad to know that you liked dal makhani recipe so much.